Who has the better breakfast cereal, Batman or Superman? By day, Gabe Fonseca is a busy TV writer whose credits include Wizards Of Waverly Place and Private Practice. (He currently toils on NBC’s The Night Shift.) In his off hours, though, Fonseca presides over Cereal Time, a web series in which the colorful, pre-sweetened breakfast foods of yesterday and today are thoroughly analyzed, rated, and deconstructed. 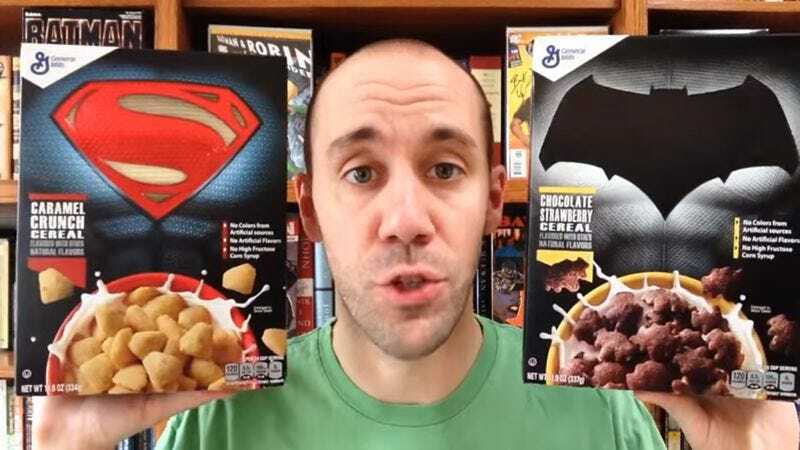 A recent episode of Cereal Time was given over to a discussion of General Mills’ two new cereals released in anticipation of Warner Bros.’ Batman V Superman: Dawn Of Justice, which hits theaters on March 26. Batman is being honored with a chocolate-and-strawberry-flavored cereal shaped like little bats, while Superman gets a shield-shaped caramel cereal. Both products come in very cool-looking boxes designed to look like close-ups of their respective heroes’ iconic costumes. General Mills is already the home of the famed “monster” cereals, with battling mascots Franken Berry and Count Chocula, so this kind of intra-company rivalry is nothing new. Fonseca is not particularly psyched about the upcoming movie. “It looks terrible,” he states flatly. But the dueling cereals have his full attention. Both get relatively high marks from the expert, though Batman has the advantage because he’s just a cooler character in general. Also, there aren’t any other kids’ cereals with the combination of strawberry and chocolate. (Special K does not count.) Superman’s cereal is nothing to scoff at, though. Fonseca actually prefers the design of the Superman box and gives the cereal inside it a positive appraisal, though he says it could stand to be a little sweeter. Both characters have been down this road before, Fonseca points out. The Dark Knight has had his own cereal at least three times before, starting with the one Ralston released in 1989 to coincide with the Tim Burton movie. The Man Of Steel, on the other hand, had to settle for slightly modified versions of existing cereals, like Captain Crunch and Life. Maybe this new cereal will turn the tide in his direction.